Lu, Z., Wang, M., Jia, W., and Zhao, Z. (2017). "Effects of hot air temperature on drying properties of biomass brick during heat treatment," BioRes. 12(2), 3236-3249. The effects of hot air temperature on the drying properties of biomass brick during heat treatment were examined. Biomass brick was dried for 156 h at 30 °C to 80 °C and 50% relative humidity. The results showed that the moisture content and density of the brick during heat treatment were affected greatly by the hot air temperature. The moisture content was affected remarkably by the drying time. Drying shrinkage extents were affected noticeably by the drying time and air temperature. The moisture content and density after drying were decreased with increased time. The compression strength increased with the increased air temperature from 30 °C to 70 °C. There are around 0.549 billion m3 of poplar wood stock and 0.25 billion tons of corn stalk in China (Lu 2012). Therefore, it is interesting to study their effective utilization. Poplar wood fiber can be manufactured into fiberboard (Dong 2008; Wu et al. 2012; Xie et al. 2014), wood plastic composites (Gao et al. 2014), and wooden ceramics (Sun et al. 2009; Gao et al. 2011). Corn stalk fiber and particles can be manufactured into corrugated paper (Li and Guo 2005), packaging material (Liu et al. 2006), foam material (Zheng et al. 2010), straw-cement composite material, straw-plastic composite material, straw-wood composite material (Cheng 2013), and biomass building material (Jiang et al. 2010). Calcium hydroxide is an inorganic binder and is one of the earliest adhesives in history. It can be manufactured into a calcium hydroxide slurry (Ohtsu et al. 2011), cement mortar (Ma et al. 2011), tung oil mortar (Wei et al. 2013 ), and sticky rice mortar (Wei et al. 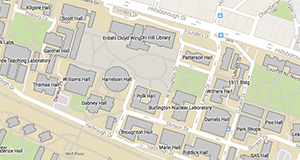 2015), which is used widely in the building engineering field (Wei et al. 2012). There is currently about 40 billion m2 of building area in China (Kang 2014), and the area will grow to 68.8 billion m2 by 2020 (Ji 2011). Poplar wood, corn stalk fibers, and calcium hydroxide can be mixed and molded into light biomass bricks for indoor partition walls, which provides a new way to utilize the abundant supply of poplar wood waste and corn stalk. Biomass is molded from loose, big volume bricks to compact and small solid ones (Kang 2014). During the drying process, carbon dioxide reacts with calcium hydroxide to produce calcium carbonate, which increases the strength of the brick. In the present study, the effects of air temperature on the drying properties of biomass brick, which was dried at 50% relative humidity and 30 °C to 80 °C air temperature, were studied. The moisture content, drying shrinkage extent, density, and compression strength were evaluated to provide a basic theory for the manufacture and application of biomass brick. The properties of poplar wood (Shandong Province, China), corn stalk fibers (Shandong Province, Chia), and calcium hydroxide (Taian, Shandong Province, China ) are shown in Table 1. The mass of poplar wood, corn stalk fibers, and calcium hydroxide were tested using an electrical balance (Model JA21002, Shanghai Jingtian Electrical Instrument Co., Shanghai, China) with a precision of 0.01 g. The moisture content of the raw materials was tested using a halogen moisture detector (Model JT-K6, Jingtai Co., Taizhou, China). They were mixed completely with a Model JJ-5, mixing machine (Shandong Luda Test Measurement Machine Co., Taian, China) and put into squeeze die, as shown in Fig. 1. The squeeze die was customized for the experiment (Shandong Luda Test Measurement Machine Co., Taian, China), as shown in Fig. 2. The parts of the dye consisted of a squeeze head, a bucket, and backing boards. The head was the loading body. The bucket had a rectangular shape; the interior dimensions were 235 mm in length, 110 mm in width, and 150 mm in thickness. The backing board was the loaded body. Brick was molded in the press machine (Model MY 50B, Qingdao Jilongchang Equipment Machine Co., Qingdao, China). The press load was equal to the largest load when the head was pressed into the bucket completely. The pressing was maintained for 10 min (press time), and the temperature was kept at room temperature. The press time was measured with a second meter (Model PC 396, Shenzhen Huibo Industry and Trade Co., Shenzhen, China) with the precision of 0.01 s. The dimensions of the wet brick in length, width, and thickness were measured with the plastic ruler (Model 30 CM, Deli Group Co., Zhejiang, China). Its mass was weighed with an electrical balance (Model ACS-302, Shanghai Huachao Electrical Instrument Co., Shanghai, China) with a precision of 1 g.
Wet brick was dried for 156 h in the constant temperature and humidity drying chamber (Shanghai Yiheng Science and Technology Co., Model LHS-HC-I, Shanghai, China; Shanghai Baixin Test Measurement Machine and Equipment Co., Model HS010A, Shanghai, China), where it was kept at 50% relative humidity and 30 °C to 80 °C, with a 10 °C interval in air temperature. The air temperature was equal to 30 °C, 40 °C, 50 °C, 60 °C, 70 °C, or 80 °C, and it was adjusted by a control panel on the machine. The air relative humidity and temperature were measured using a temperature and humidification electrical meter in the chamber. Drying experiments were repeated 5 times for every condition. The dimensions of dried brick in length, width, and thickness were measured, and the compression strength was tested with an electrical strength test machine (Model DTH-300B, Shandong Luda Test Measurement Machine Co., Taian, China). The brick was loaded vertically in thickness at 1.0 mm/min movement velocity. When the deformation reached 2.5 mm in thickness, the load was the compression strength. The thickness of the brick was as same as before when the press was unloaded. The brick was dried to absolute dryness (0% moisture content) via a hot air drying box (Model DUG 9123A, Shanghai Jinghong Experiment Instrument Co., Shanghai, China) with the precision of 0.1 °C, where the hot air temperature was 50 °C. 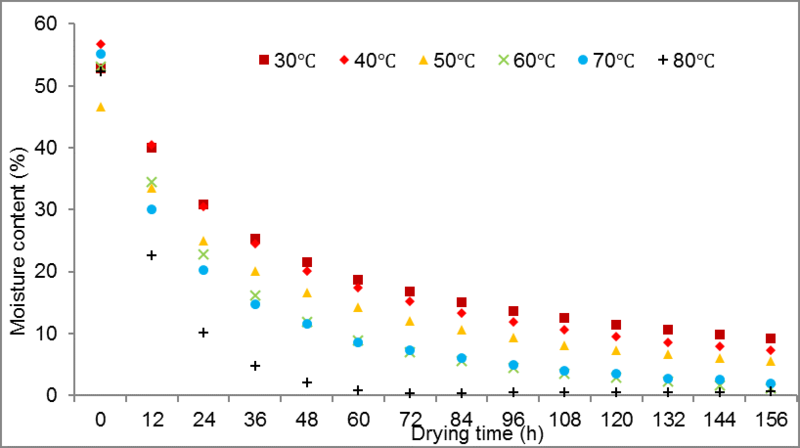 The mass of the dried brick was tested using an electrical balance (Model JA21002, Shanghai Jingtian Electrical Instrument Co., Shanghai, China) with a precision of 0.01 g.
The moisture content of the brick decreased with an increase in the heating time from 0 to 156 h during the drying process, as shown in Fig. 3. The reason was that the moisture evaporation content increased with the increase in time when the brick was dried in the hot air drying environment. The drying ability of air was increased with increased air temperature, so that the air temperature should have been increased to improve the drying efficiency. When the brick was dried for 120 h at 30 °C, 96 h at 40 °C, 84 h at 50 °C, 60 h at 60 °C and 70 °C, and 24 h at 80 °C, its moisture content was between 10% and 12%, which was the atmospheric equilibrium moisture content of the brick-used environment. The moisture content of 10% to12%, is important for the brickmaking, because that it is not necessary to dry the material to a lower moisture content at the cost of heat energy consumption. Moreover, it is important for the user because the moisture content will be in equilibrium with a typical moisture content of the air, and there will not a big moisture content change upon exposure to the environment. Also, there will not be a corresponding dimensional change, and it is useful to maintain specified dimensions of biomass brick. When the difference of the moisture content was greater than 5%, it was noticeable. The differences of the moisture contents shown in Table 2 were greater than 40%; it follows that the moisture contents were affected greatly by the drying time. 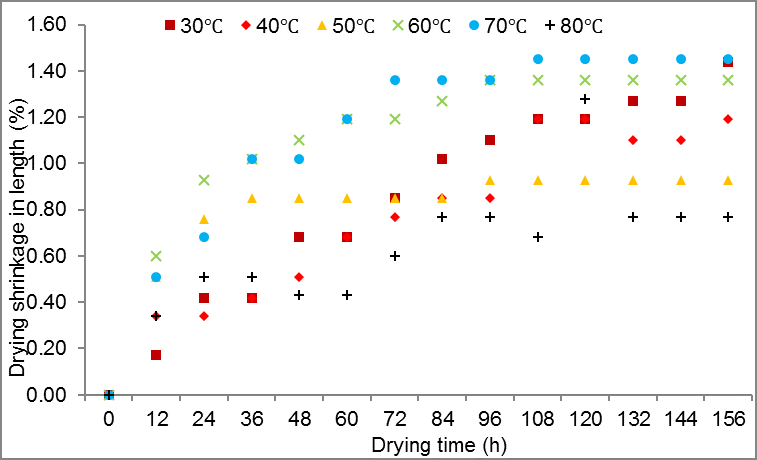 The moisture content of the brick was different at different air temperatures when the drying time was the same, as shown in Fig. 3. It was the highest at 30 °C and the lowest at 80 °C, because the drying ability of air was increased with an increased air temperature. When the brick was dried from 24 h to 60 h, the moisture content was decreased with an increased air temperature that ranged from 30 °C to 80 °C. When the brick was dried from 72 h to 156 h, it decreased with the increased air temperature that ranged from 30°C to 60°C. When the difference of the moisture content was greater than 5%, it was judged to be noticeable. 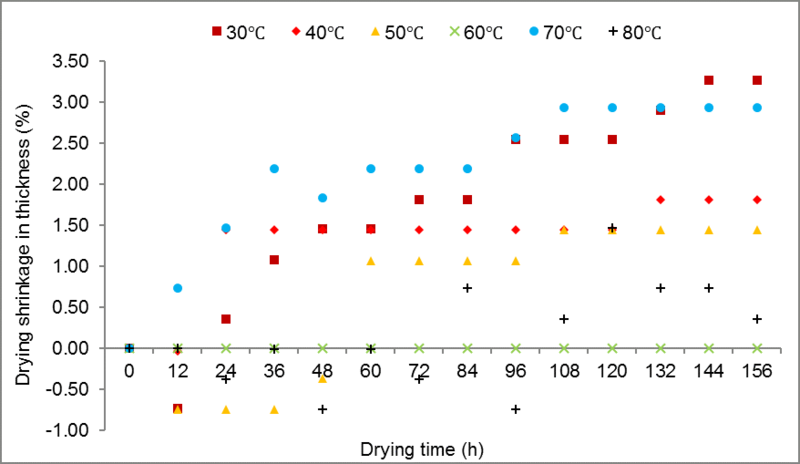 The differences of the moisture contents were greater than 5% when the air temperature ranged from 30 °C to 80 °C (Table 3); therefore, the moisture contents were affected greatly by the drying time. Drying shrinkage is important because that it is vital to the final dimension of brick. When the final dimension is specified, it is used to design the initial size of wet brick, and the dimensions of the press die. 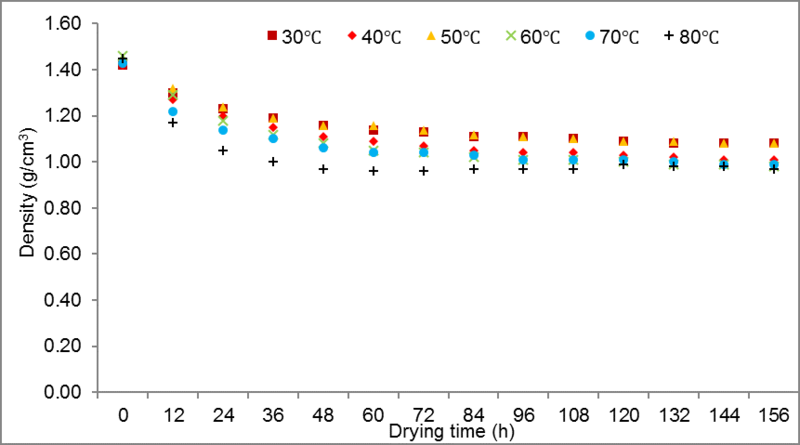 When the drying time stage was between 12 h and 156 h, the drying shrinkage extent of brick in length increased with increased drying time (Fig. 4). When the percentage of the difference value to the greatest drying shrinkage extent was greater than 30%, it was noticeable. The percentages of the difference value to the greatest drying shrinkage extent were greater than 45% in Table 4. Therefore, the drying shrinkage extents of brick in length were affected greatly by the drying time. When the percentage of the difference value to the greatest drying shrinkage extent was greater than 30%, it was noticeable. The percentages of the difference value to the greatest drying shrinkage extent were greater than 35% in Table 5. Therefore, the air temperature affected the drying shrinkage extents of brick in length greatly. When the drying time stage was between 12 h and 156 h, the percentages of the difference value to the greatest drying shrinkage extent were greater than 50% in Fig. 5 and Table 6. Therefore, the drying shrinkage extents of brick in width were affected greatly by the drying time. The percentages of the difference value to the greatest drying shrinkage extent were greater than 30% in Table 7. Therefore, the air temperature affected the drying shrinkage extents of brick in width greatly. When the drying time stage was between 12 h and 156 h, the percentages of the difference value to the greatest drying shrinkage extent were greater than 75%, as shown in Fig. 6 and Table 8. Therefore, the drying shrinkage extents of brick in thickness were affected greatly by the drying time. The percentages of the difference value to the greatest drying shrinkage extent were greater than 100% in Table 9. Thus, the air temperature affected the drying shrinkage extents of brick in thickness greatly. The density of brick decreased with increased time in Fig. 7. When the percentage of difference value to the greatest drying density was greater than 10%, it was considered to be noticeable. 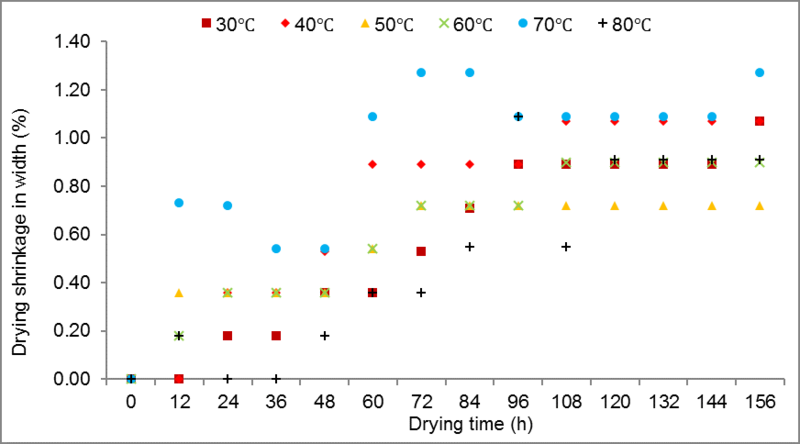 The percentages of the difference value to the greatest drying density were greater than 20% when the air temperature ranged from 30 °C to 80 °C in Table 10. Therefore, the densities were affected greatly by the drying time. When the drying time ranged from 12 h to 156 h, the density of the brick was the greatest at 50 °C air temperature, and it was the least at 80 °C. When the percentage of the difference value to the greatest drying density was greater than 10%, it was considered to be noticeable. The percentages of the difference value to the greatest drying density were greater than 10%, when the drying time ranged from 12 h to 108 h, and 132 h to 156 h in Table 11. Therefore, the densities were affected greatly by the drying time. 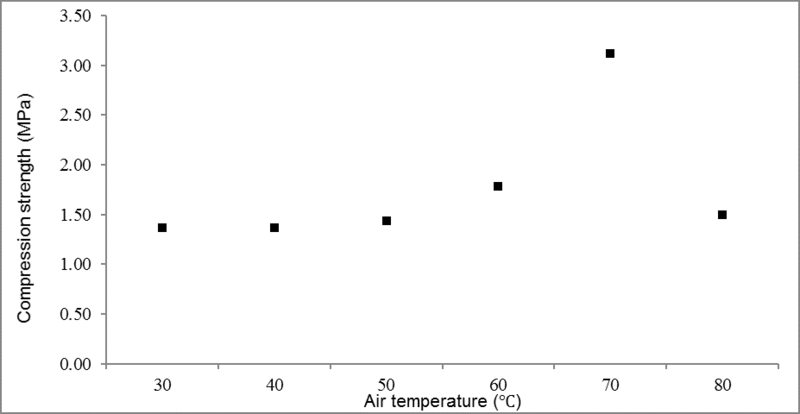 The compression strength of brick increased with increased air temperature, which ranged from 30 °C to 70 °C, as shown in Fig. 8. However, it decreased with increased air temperature that ranged from 70 °C to 80 °C. The average compression strength was 1.76 MPa and ranged from 1.37 MPa to 3.12 MPa, with the difference of 1.75 MPa, and the largest compression strength was 2.88 times the size of the smallest one. Therefore, the air temperature affected the compression strength greatly. The moisture content of biomass brick during the drying process was greatly affected by the air temperature from 30 to 80 °C. It decreased with an increase in the time from 0 to 156 h.
The drying shrinkage extents in length, width, and thickness were affected greatly by the drying time and air temperature. The drying shrinkage extents in length, width, and thickness were affected greatly by the drying time and air temperature. When the drying time stage was between 12 h and 156 h, the percentages of the difference value to the greatest drying shrinkage extent were greater than 45% in length, 50% in width and 75% in thickness. The density of brick was affected greatly by the air temperature, which decreased with increased time. The percentages of the difference value to the greatest drying density were greater than 20%, when the air temperature ranged from 30 °C to 80 °C. The percentages of the difference value to the greatest drying density were greater than 10%, when the drying time ranged from 12 h to 108 h, and 132 h to 156 h.
The compression strength was affected greatly by the air temperature, which increased with increased air temperature that ranged from 30 °C to 70 °C, and decreased with increased air temperature that ranged from 70 °C to 80 °C. The work was supported by the Project of Special Funds for Forest Scientific Research in the Public Welfare, No. 201504506, China. Classmates Hongmeng Zhao and Chao Ma in Shandong Agricultural University should be thanked for their help with the experiments for the article. Cheng, G. (2013). Material Experiment: Study on Modern Architectural Space Construction Based on Stalk Materials, Master’s Thesis, Nanjing Art College, Nanjing, China. Dong, X. H. (2008). Research on the Production Process of Wet-wood Fiber-molded Shutter, Master’s Thesis, Northeast Forestry University, Harbin, China. Gao, J. M., Meng, L. X., Qi, J. K., Ma, T., Yan, Z. L., and Zhou, Z. L. (2011). “Research on silicon carbide wood ceramics from poplar fiber,” Rare Metal Materials and Engineering 40(suppl.1), 223-226. Gao, X., Cheng, W. L., Wang, H. G., Han, G. P., and Li, Z. (2014). “Effect of wood fiber geometry on properties of wood plastic composites,” Journal of Northeast University 42(2), 100-103. Ji, J. (2011). Application of New Crop Straw Composite Wall, Master’s Thesis, Xi’an University of Science and Technology, Xi’an, China. Jiang, L. J., Li, Q. L., Miao, H. Y., Liu, H., Du, B., Wang, L., Zheng, G. F., and Li, T. H. (2010). “Research on thermal performance of insurance wall filled with crop stalks in fly ash block,” New Building Materials 7, 51-53. Kang, Y. (2014). “Study on using raw resources developing rural building wall prod-ucts,” Master’s Thesis, Lanzhou University of Technology, Lanzhou, China, 1-50. Li, J., and Guo, K. Q. (2005). “Experimental study on corrugated paper production from corn stalk by hot press process,” Journal of Agricultural Mechanics 36(7), 89-91. Liu, Z., Zhu, L., Gao, D., and Sun, Z. H. (2006). “Studies on cushioning package material made of corn straw and EPS and its properties,” Packaging Eng. 27(6), 27-30, 48. Lu, J. (2012). The Study on the Corn Straw Skin Composite Board Used as Floor Substrate, Master’s Thesis, Northeast Forestry University, Harbin, China. Ma, B. G., Gao, L., Jian, S. W., Sun, L., Song, X. F., and Xun, R. L. (2011). “Effect of several activators on the activity of aerated concrete waste and the mechanism,” Materials Review 25(4), 111-114. Sun, D. L., Liu, W. J., and Yu, X. C. (2009). “Effects of sintering temperature and PF resin content on phases and microstructure characteristics of wood ceramics,” Journal of Beijing Forestry University 31(4), 112-117. Wei, G. F., Zhang, B. J., and Fang, S. Q. (2012). “Aging mechanism of quicklime and application study of aged lime in conservation of cultural relics,” Journal of Building Materials 15(1), 96-102. Wu, D. R., You, J. J., Wang, X. M., and Shen, Y. (2012). “Study on enhancement of MDF mechanical properties of Salix willow wood reinforced poplar and willow,” Chinese Forestry Products Industry 39(6), 47-49. Xie, L. S., Liu, J. Q., and Du, A. L. (2014). “Effect of hot pressing factors on poplar binderless fiberboard properties,” Journal of Northeast Forestry University 42(2), 101-103. Zheng, S. R., He, W. Q., Zhang, C. L., Wang, X., Zheng, G. H., and Li, T. H. (2010). “Application and research of corn stalk broken powder filled polyurethane foam insulation plastic,” Application of Engineering Plastic 28(2), 47-50. Article submitted: November 12, 2016; Peer review completed: January 28, 2017; Revised version received and accepted: March 6, 2017; Published: March 15, 2017.